Find out how to make pigs in blankets (sausage wrapped in bacon), the perfect accompaniment to a traditional roast turkey Christmas dinner. 1. Preheat the oven to 200 ̊C (180 ̊C fan), gas mark 6. Mix the date nectar, mustard and seasoning in a large bowl. Toss the sausages in the bowl to coat in the mixture. 2. Cut each slice of pancetta in half, then wrap each sausage in a piece of pancetta. Place on a parchment-lined baking tray. 3. Bake for 30-35 minutes, until golden and sticky. Try swapping the pancetta for streaky bacon. 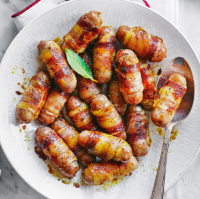 These pigs in blankets can be served as a canape, simply pop them on a platter with a cocktail stick. For an American twist, wrap the sausage in bacon, roll in puff pastry then bake in the oven and serve warm with your Christmas lunch or as a nibble over the festive season. This delicious alternative sausage roll works perfectly dipped into cranberry sauce.